"Grandmother'sName Ring Personalized for Two Children, Silver, Stackable"
Personalize the band with the names of your grandchildren for a wonderful gift for grandma. The customization looks great with a bullet or a heart between the names. have it gift wraped in our signature lavender and rosebud packaging! 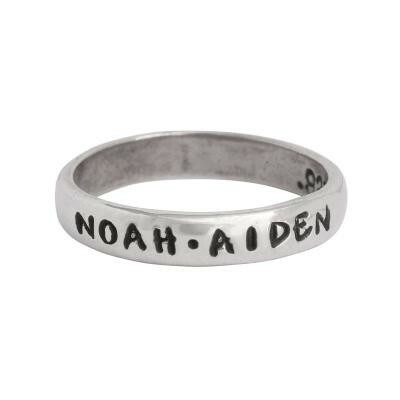 The single grandmother's name ring can be custom stamped with the names of two grandchildren. Separate the names with a heart or a bullet. Our single rings can be stacked together or worn on either side of an existing ring. Wonderful gift on Mother's Day or a family ring for each member to wear. Our single band is simple and sophisticated. It is a great add on ring if you have ordered a double or triple in the past and then have another grandchild. This single band looks good stacked with our double, triple or our birthstone rings.